Baseball bat reviews are inundated with the word ‘pop’. “Amazing Pop”, “Great Pop”, “Freakish Pop” and so on and so on. Baseball bat reviews are inundated with the word ‘pop’. “Amazing Pop”, “Great Pop”, “Freakish Pop” and so on and so on. This drives me batty for a handful of reasons. Not the least of which is how .50 BBCOR and BPF 1.15 … Jump to the full review. We aren’t the only ones to have information about the Generations. Other places, in particular those who sell bats, usually have a boiler plate write up on the specs of a bat. Many of those we reference to make sure we are seeing what we should be. Here are some more references for the 2015 Mizuno Generations review. Baseball bat reviews are inundated with the word ‘pop’. “Amazing Pop”, “Great Pop”, “Freakish Pop” and so on and so on. This drives me batty for a handful of reasons. Not the least of which is how .50 BBCOR and BPF 1.15 regulations constrain the trampoline effect of performance alloy and composite bats which make any claim of ‘pop’ vs another high performance bat an unfounded claim. Quite truthfully, top-shelf high performance bats don’t have different ‘pop’. They aren’t allowed to. And most big time companies with big time wallets make sure their big time bats get as close to that regulatory limit as possible. Performance bats do, however, have different sting dampening, barrel size, price point, swing weight as well as a different sound on contact. Two of these factors, sting dampening and sound, weigh heavily in a hitters experience in deciphering how hard they hit the ball. But while those two principles may hold true with wood bats, composite and alloy bats “pop” is far from a feel or sound test. The real differences in composite and alloy bats are sometimes worth paying for. For the 2015 Mizuno Generations baseball bat has its real competitive advantage in its barrel and sweet spot size. We are not sure why there isn’t a drop 8 or drop 5 in the Generations but wish there was. Especially for a bat boasting the largest sweet spot in the business it would be nice to have some umph behind that bat in the upper echelons of little league where just about no one is swinging a drop 10. Mizuno’s pricing is, in our opinion, its real sweet spot. And for Mizuno’s first run in bat space they’ve made a great decision on keeping pricing honest. Lots of new comers to the market have a real tendency to think a $300+ bat is the market. But the truth is a sub $200 dollar swing for a performance bat is the real sweet spot…and probably the most notable one Mizuno has this year. For Mizuno’s first foray into the metal bat space they get high marks. The swing weight should be applicable to a number of players and the price is right in line what a lot of parents are willing to spend. The grip at first contact does feel great but has a few users disappointing in its durability. As well, finding a way to help damping the sting on mishits would be an improvement. We would recommend the Mizuno Generations to players looking for a middle of the road swing weight and want a decent sized barrel in the aluminum space. This is not a power hitter’s bat. The hitter also needs to prefer one piece alloy barrels that ring a bit on mishits. It is available for purchase here and here. After our review of the Portent G3 baseball bat a couple days back, we were reminded we’ve yet to put up Combat Bat Reviews on the other two 2015 performance baseball bats from Canada: The 2015 Combat Wanted and the 2015 Combat Fray Hybrid. I believe we have seen and touched every 2015 BBCOR bat on the market. We’ve learned a couple things along the way. For starters, lots of bats aren’t much different than the next. Second, we are obsessed with baseball bats. And third, looks can be deceiving. DeMarini releases a whole slew of bat lines every year in baseball. Their top shelf bat, for 2015, is the ever famous two-piece balanced composite CF7 (which we love). The bat is a one piece aluminum stick with a balanced swing. Not hand loaded, mind you, like the Helium Baseball Bat or Velo Rawlings. The BBCOR Generations baseball bat is right in the middle of all the bats we’ve calculated for swing weight this year. The Generations swing is most comparable to the Easton S3 BBCOR. As well, the swing weight is balanced in all the iterations of the this bat. The senior league is a drop 10 (2 5/8 Barrel) and youth barrel is a drop 12 (2 1/4). There is also a t-ball version. 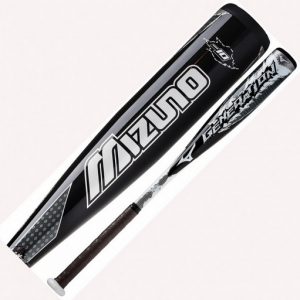 The 2015 Mizuno Generation baseball bat boasts a tapered alloy wall. Outside the center of the barrel the bat walls are thinner. This allows the bat to pass BBCOR standards with less trampoline effect in the middle of the barrel as well as extending the length of usable sweet spot. In other words, if the bat is tuned perfectly, you can get the same .50 BBCOR or BPF 1.15 pop along any part of the barrel. Notice in the picture below a tapered inner wall–which Mizuno is calling, for some reason, Pentad Technology. We really like this idea and think it makes a ton of sense in the .50 BBCOR restricted space. All reports, and our experience as well, really do show good usability along all parts of the barrel. Mizuno claims this tapper modification also gives Mizuno Generation baseball bats the largest sweet spot in the space for 2015. If every bat company wasn’t claiming the same thing we’d be a little more convinced. Regardless of our hyperbole meter going off, the Generations clearly has a wide sweet spot and any hitter looking for the “biggest” sweet spot in the game can rest assured the 2015 Mizuno Generations is on that list (if not the actual top of it).